(14:50) Is all information useful? 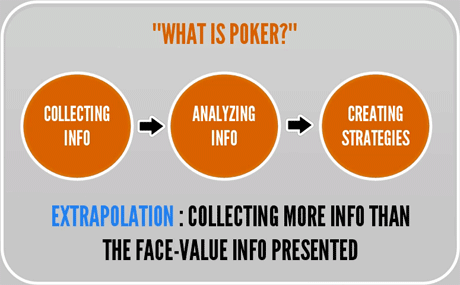 Extrapolation in poker involves observing and analyzing the decisions your opponents make, then using this information to help you figure out how to play more profitably against them in future hands. There's a lot more that you can learn from your opponent's betting patterns and bet sizes than you may think. SplitSuit's aim in this concept video is to highlight the value of this extra information and show you how you can extrapolate for yourself. The video begins with an explanation and some theory on extrapolation and ends with a set of 4 hand history examples that make full use of extrapolation in poker. Definition of extrapolation and how it fits in to poker strategy.